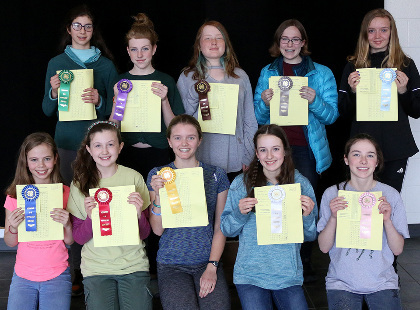 Danville--More than 70 Vermont 4-H club members turned out on April 7 for the annual State 4-H Horse Hippology Contest, co-sponsored by University of Vermont (UVM) Extension 4-H and 4-H in Caledonia and Essex Counties. The two-part competition had the 4-H'ers judging two classes of horses, thoroughbreds in hand and English pleasure, at Northern Lights Stable in Danville before heading to Danville School for the remainder of the contest, which included a written test, slides and identification stations. The competition was arranged by age with different questions and skills tests for each age group. The four top finishers in the senior division for ages 14 and older qualified for the State 4-H Horse Hippology Team, which will represent Vermont at the Northeast Regional 4-H Horse Contests in Concord, New Hampshire, and the Eastern National 4-H Horse Round-Up in Louisville, Kentucky, this fall. They include, in order of placement, Chelsea Carcoba, Danville; Grace Parks and Hannah Lang, both from Essex; and Emma Cushman, Barre. Rounding out the top 10 in the Senior Division are Allison Tourville, Georgia; Bridget Webber, Burke; Faith Ploof, Westford; Madison Zimmermann, Northfield; Catherine Stone, St. Johnsbury; and Lillie Tuckerman, South Woodstock. Laura Mount, Westfield, placed first in the Novice Senior Division for 4-H'ers 14 and older who are new to 4-H or the state hippology contest. Tanya Bedor, St. Johnsbury, came in second. Assisting with the event were Hailee Blades, Jeffersonville, and Eva Joly, Essex Junction, both of whom competed on previous State 4-H Horse Hippology teams. To learn more about the Vermont 4-H horse program, contact Wendy Sorrell, UVM Extension 4-H livestock educator at wendy.sorrell@uvm.edu.